AFP DC Career Center offers professional services to help you build and manage your career for maximum potential for success. Check out these resources! Attract top industry employers with your AFP/DC Membership. Are you new to this profession? Have you just changed careers? Fields? Expertise area? Then consider joining the AFP Mentoring Program. The AFP Resource Center provides members and other fundraising professionals with customized research assistance on fundraising issues and best practices. 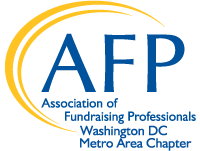 AFP offers a number of educational opportunities especially for the experienced fundraising practitioner. Regardless of your years of experience or specific passion, AFP DC's educational lineup offers something for everyone. Philanthropy Day is an annual celebration of philanthropy that recognizes local philanthropists for impacts on the philanthropic and nonprofit community.